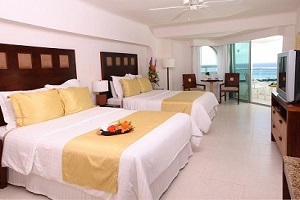 El Cid La Ceiba Beach Resort is an all-inclusive, oceanfront hotel, located in the pristine shoreline of Cozumel. The intimate design and superior level of personal attention given to guests at El Cid La Ceiba is something that makes this hotel so special; explore Mayan ruins, dive into brilliantly colored coral reefs or lounge by the pool, perfecting your tan. At El Cid La Ceiba, the choices are endless! 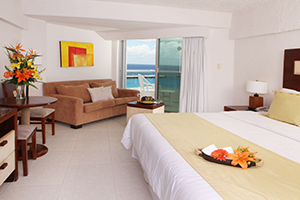 Retreat to an Oceanfront Paradise in Cozumel! With colorful reefs, exotic flora and fauna, and friendly people, Cozumel artfully blends the Mexican heart and Caribbean soul. Nestled on Cozumel's pristine southern shoreline across form Playa del Carmen, El Cid La Ceiba Beach is an oceanfront retreat in a warm and relaxing setting. 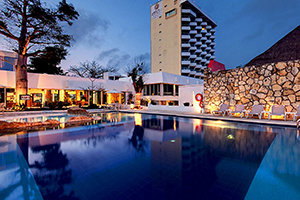 This Cozumel hotel on the beach offers guests an ideal locale, overlooking Villa Blanca, Paradise Reef and Las Palmas reefs and just three miles from a colorful downtown San Miguel. The moment you arrive at El Cid La Ceiba Beach, you'll sense the refreshing authenticity, intimate design and superior level of personal attention. Whether you're there to dive brilliantly colored Caribbean reefs, explore ancient Mayan ruins, or lounge by the pool perfecting your tan, the inviting Cozumel lodging is ideal.